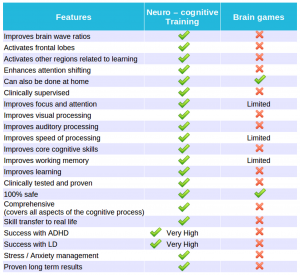 Can brain games resolve ADHD related problems? The answer is no! Computer games may be fun to play with and they may help provide convenient distraction, but they do not re-wire the brain, which is the only way to resolve ADHD related deficiencies. Our advanced, patented, training technology, while it looks like a game is very different. Not only does it train the brain to process information effectively by rewiring the frontal cortex (which is a 100% safe protocol with numerous side benefits), it also helps in enhancing most core cognitive skills. See the comparison table below.